This is a receipt of payment for Edwin G. Eastman, created by M. Thayer on July 20, 1871. In the receipt, Thayer acknowledges the sale of two horses to Eastman for $750. Thayer attests in the handwritten receipt that both horses are of generally sound health. Eastman was an associate of Henry Shelton Sanford (1823-1891). The two initially met through their mutual service in the U.S. Diplomatic Corps during the American Civil War. Eastman served as an advisor and representative to Sanford for a brief period between 1870 and 1871. Eastman oversaw operations in the what would become Sanford, Florida, beginning in December 1870. He was put in charge by Henry Sanford to ensure the successful management of the sawmill built in 1870, He was also tasked with maintaining the various experimental groves owned by Sanford, first St. Gertrude's Grove and later Belair Grove. The more successful of the two, Belair Grove, was an experimental grove located three miles southwest of the city named after Sanford. It was part of the Sanford Grant, a 12,547.15-square acre allotment of land purchased by Henry Sanford in 1870. In Belair, Sanford introduced over 140 varieties of citrus plants. All were tested to determine if Florida citrus growers could effectively grow and introduce new varieties into the burgeoning citrus market. Sanford also grew exotic plants acquired from Central and South America, many of which survived the 1886 freeze. Sanford mainly used Belair as his own experiment station, but ultimately the findings and reports would be used by other citrus growers throughout Florida. Eventually, following Sanford's death in 1891, his wife, Gertrude Ellen Dupuy Sanford (1841-1902), handed over the operations of Belair to Sydney Octavius Chase, Sr. (1860-1941) and Joshua Coffin Chase (1858-1948). Original receipt: box 45, folder 1, subfolder 45.1.38, Henry Shelton Sanford Papers, General Henry S. Sanford Memorial Library, Sanford Museum, Sanford, Florida. "Receipt of Payment for Edwin G. Eastman from M. Thayer (July 20, 1871)." RICHES of Central Florida. hhttps://richesmi.cah.ucf.edu/omeka2/items/show/4004. Digital reproduction of original receipt. Box 45, folder 1, Henry Shelton Sanford Papers, General Henry S. Sanford Memorial Library, Sanford Museum, Sanford, Florida. Originally created by M. Thayer. Some Account of Belair, Also of the City of Sanford Florida, With a Brief Sketch of Their Founder. Sanford, Florida: 1889. 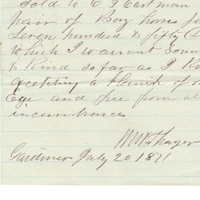 Thayer, M.. “Acknowledgement of Sale of Horses for Edwin G. Eastman from M. Thayer (July 20, 1871).” RICHES of Central Florida accessed April 20, 2019, https://richesmi.cah.ucf.edu/omeka/items/show/4006.